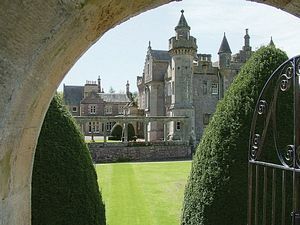 Abbotsford is the house built and lived in by Sir Walter Scott, the 19th century novelist, and author of timeless classics such as Waverley, Rob Roy, Ivanhoe and The Lady of the Lake. Situated on the banks of the River Tweed, west of Melrose, the house contains an impressive collection of historic relics, weapons and armour including Rob Roy's gun and Montrose's Sword. There is also a library containing over 9,000 rare volumes. Visitors will be able to see Sir Walter Scott's Study, Library, Drawing Room, Entrance Hall, Armouries and the Dining Room where he died on 21st September 1832. There are Extensive Grounds, a Walled Garden and a Woodland Walk for visitors to enjoy. The Private Chapel which was built in 1855, after Scott's death, by his granddaughter Charlotte and her husband James Hope-Scott is also open to visitors. Just 2 miles from Melrose. Travelling on the A68, take the A6091 Melrose Bypass, heading North towards Galashiels. Turn left at the second roundabout onto the B6360. Car Parking facilities on left opposite Abbotsford.